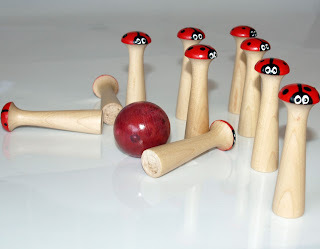 The Barefoot Woodworker: Win a Handmade Lady Bug Bowling Game! 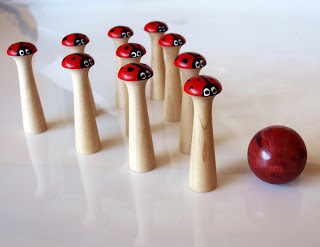 Win a Handmade Lady Bug Bowling Game! Can't wait to win it? These adorable little lady bugs are brightly hand painted. Their wide eyes seem to know the ball is coming for them! We happened upon our friendly wood sprites bowling with some of the loose items in our shop. I guess after a busy day of mischief , even these wee folk like to take a moment for some …well more fun. We noticed they had collected up some ladybugs to play with as well. 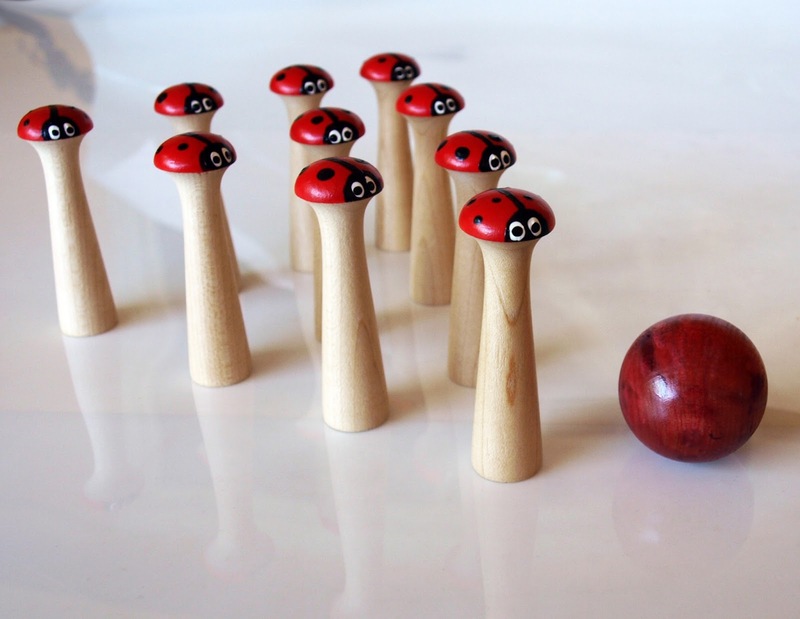 So when they weren't looking we hand-painted these wooden pegs to look like lady bugs and freed the real ones. The Sprites happily played with these as they don't try to escape. Now you can attract your own Wood Sprites with these adorable Lady Bugs to bring your home good luck and to keep the real ladybugs safe. Just don't knock on wood or you'll scare the Sprites away! Play anywhere - or keep these cute guys on display to show your whimsical side. Fun to play with - easy to set up again and again anywhere there is a flat surface. Each wooden bowling pin (or skittle) measures approximately 3" and this set comes with a hand-dyed red wooden ball. 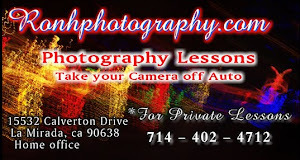 Items may vary slightly as they are all hand-painted. All are finished with a semi-gloss to protect the paint of the ladybugs from that mean ball.